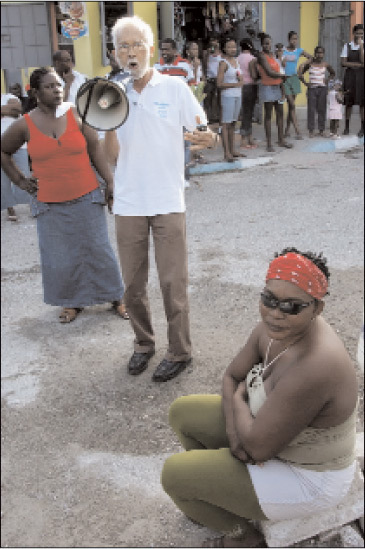 Horace Levy, senior member of the Peace Management Initiative, and Marie Bucknor, a resident of August Town, urging community members to put an end to the violence that has affected the community for the past 14 months, while this despondent resident hoped for the change. Caption: Up next the "Dutty Wine" contest. All contestants line up. Caption: "We are calling on the authorities at this time, to help us remove this woman from the roadway!" Caption: Will the owner of the red mazda 323 please move your vehicle...you are blocking these ladies lada! thank you! Caption: POOR PEOPLE FED UP!!! Caption: Gi mi a nada chance nuh.Mi love yu. Caption: "Jamaican ghetto people. (oops I mean innercity) Listen to me. Believe me. I am really on your side for true..."
Caption: Yow! Me is the original don dadda and i said to put down the gun them and stop the killing, right now! Caption: DEFUSE THE CRIME,COME FORWARD AND MAKE IT RIGHT. Caption: "Uno too outa order, uno fi behave uno self and live ina peace"
Thank you for the 50 responses we received. Enter again and we hope you will be the outright winner next time.